Table Tennis (generally referred to as Ping Pong in the USA), is primarily an indoor sport, but it's so versatile that it can be played almost anywhere, including outdoors. In fact, outdoor table tennis is booming and it's now THE social outdoor activity of choice in the USA and Europe. In many parts of the world, concrete table tennis tables are commonplace. Germany is a european hotspot for outdoor table tennis and the Chinese have been playing table tennis outdoors for years. 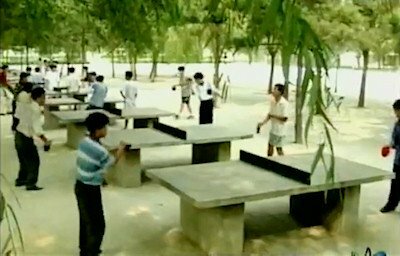 In fact, I remember a friend of mine telling me after he visited China in 1971 for Ping Pong Diplomacy, that he saw hundreds of concrete table tennis tables in public open spaces which were extremely popular with people of all ages. In July 2010 Ping London was launched in order to promote the sport of table tennis, and to mark the two year countdown to the London 2012 Olympic Games and Paralympic Games. A hundred outdoor table tennis tables were placed around London for four weeks. The tables all featured a "Stop and Play" sign and any individual was allowed to participate on any table as long as they returned the racket and balls to the side of the table after they had finished playing. The Ping! project proved so successful (over 50,000 people took part) that many tables were retained as a permanent feature and in 2011 the project was extended to a further 9 cities around the UK, before returning to London just prior to the start of the 2012 Olympic Games. So, it's true to say ... Give them tables and they will play! Table tennis probably holds a unique position in sport. At the top level, it's a fast athletic sport played by fit young athletes, but it's also one of the few sports that can be played at a lower level by almost anyone, whatever their age, mobility or mental ability. Indeed, in the USA, the game is also being recommended as a method of warding off Alzheimer's and assisting in the treatment of dementia. 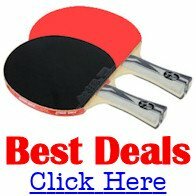 Dr. Daniel Amen, a renowned member of the American Board of Psychiatry and Neurology, and a Child, Adolescent and Adult Psychiatrist has said that "Table Tennis (ping pong) is the world's best brain sport." 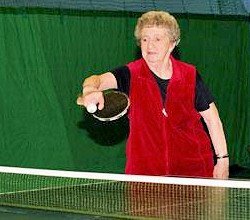 So whether it's for tackling childhood obesity, warding off Alzheimer's or just for having FUN, table tennis is a fantastic sport to be involved with! If you're considering playing table tennis outdoors you'll need to find a suitable location and ensure that the playing area and the table are fit for purpose. An outdoor table needs to be located in an area which is relatively sheltered because any strong breeze will adversely affect the flight of the ball... Or make the game more interesting, depending on your point of view! Exposed locations and windy conditions can also cause debris to be blown onto the table surface which can impede the bounce of the ball. Another important requirement is that the playing area must be on level ground with a consistent surface covering (whether it's concrete, grass or rubber matting etc) as any changes in surface covering within the playing area would create a potential hazard as players moved from one surface to another. Concrete or asphalt surfaces are the most common surface, but grass or rubber matting are better suited for some locations. The decision on which is the best surface will depend on the location and the potential users. For example, if concrete was used and, say, there were also skateboarders frequently in the same area, they might try to use the table's edges for skateboarding tricks. But if the table was on a grass or rubber matted area, they would find that much more difficult. You'll also need a playing area of approximately 28 feet x 13 feet (8.5m x 4m), although a larger area is preferable, and it needs to be away from any other equipment or obstructions. But the most critical element is the table tennis table itself. Why Are Concrete Tables The Best? Well, for outdoor locations where there'll be high usage (such as public parks, schools and camps etc), concrete tables are the only real option because they're the most weatherproof outdoor table tennis tables you can buy. And they're the most long-lasting too. Concrete tables are also much more resilient against vandalism. It's much more difficult to vandalise a concrete table tennis table than a regular outdoor table. You'll also find that regular outdoor tables need replacing every few years, whereas a concrete table tennis table should last 50-100 years with minimal maintenance. Concrete table tennis tables are primarily designed to be used in public open spaces, parks and schools etc, but they can also be used at home too. However, concrete tables are HEAVY. Of course, this is both a positive and a negative. On the positive side, heavy tables in public areas are unlikely to be moved or stolen, whereas on the negative side, getting a concrete table tennis table into your back yard could prove problematic!